Our company is open 24/7 and is based on the belief that our customers’ needs are of the utmost importance. We would welcome the opportunity to earn your trust and deliver you the best service in the industry. Company owner Terry Johnson with over 25 years experience, spearheads each investigation and we will update your enquiry as often as you prefer. We offer an initial free consultation without commitment to proceed. Confidentiality and discretion are assured at all times. F.B.I. 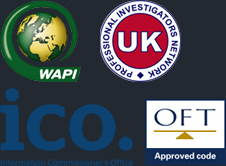 has always been a strong advocate of licensing for private investigators. The company firmly believes it is right for the customer, providing assurance that both the individual investigator and the agency meet defined standards of service. The company is licensed by the UK Office of Fair Trading for commercial enquiries and debt matters and is registered with the Data Protection Registrar in the UK.